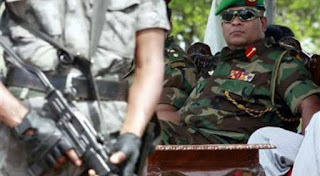 Sri Lanka's president has appointed a general accused by the United Nations of war crimes to the country's second-highest army ranking, evoking outcry from rights groups. Major General Shavendra Silva, who commanded an army division accused of gross abuses against civilians during Sri Lanka's civil war, formally assumed duties as Chief of Staff of the army on Thursday. Sri Lanka's armed forces crushed the Tamil Tiger separatist rebels in 2009 in a no-holds barred offensive that ended a 37-year war that left 100,000 people dead. The final days of the conflict saw mass atrocities against civilians in Sri Lanka's predominantly Tamil north. The UN, in a report into the allegations, named Silva as playing a major role in orchestrating war crimes. The International Truth and Justice Project, which has pursued war-era officials accused of crimes, said Silva's appointment was "a shocking new low for Sri Lanka". "This is arguably the most wanted man in Sri Lanka," the South Africa-based rights group said in a statement Thursday. "A decade on, tragically, he is being promoted instead of standing trial. We believe there is more than enough evidence to charge him for international crimes should the opportunity arise." Another rights group, the South Asian Centre for Legal Studies, said Silva's election was proof of continuing impunity in Sri Lanka. "It also signals the absence of vetting within the defence structure, allowing alleged violators of international humanitarian law and human rights law to remain in high ranking positions," the centre said. President Maithripala Sirisena, who appointed Silva in a ceremony in Colombo, said the major general's "experience and leadership will bring strength and courage" to Sri Lanka's armed forces. Silva formally assumed duties in his new positon on Thursday, the army said in a statement. A number of Sri Lankan army generals have been denied visas to travel to Western nations over their alleged role in attacks against civilians. Rights groups say at least 40,000 ethnic Tamils were killed by government forces during their push to defeat the separatist rebels. Sri Lanka's successive governments have resisted calls for an independent investigation into the conduct of troops during the final months of the conflict. President Sirisena came to power in January 2015 promising justice for war victims but his administration has been accused of dithering ever since. Sirisena, unlike his predecessor Mahinda Rajapakse, agreed to investigate war crimes but no generals have stood trial or been brought to justice.